Our team is here to serve you with excellent health care. We’re in-network providers for most insurances and have on-site X-ray facilities for your convenience. Since 1948, we’ve served our community with excellent natural health care. 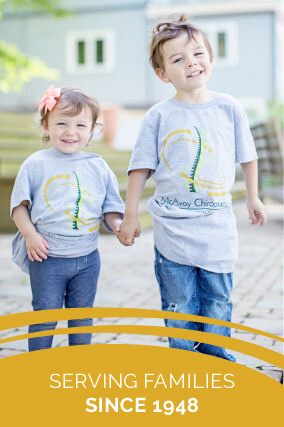 Franklin Chiropractor Dr. Katie McAvoy took over the practice after being mentored by Dr. Krsko for several years and is proud to carry on the tradition of providing customized health solutions to babies, children, adults and seniors in our area. Dr. Shannon Kurtz joins her at McAvoy Chiropractic, LLC. Together, they support the health of our community with a range of chiropractic techniques, active and passive rehabilitation and nutrition advice. We like to get to know our patients, listening carefully to their concerns and creating personalized plans to help them get better. Though we want to keep your visits efficient, fitting easily into your day, we’ll also spend all the time necessary with you to thoroughly address your needs. All ages feel at home in our beautiful, relaxing facility. Treatment plans are tailored to the needs of each individual. We’ll discuss the benefits of wellness care after any discomfort you’re in has been relieved, but the decision to continue care is always yours. We’re here for you, whenever you decide you need us. Too many people are living with chronic pain. Some don’t even realize how bad it’s gotten until it’s finally gone, and then wonder why they waited so long to visit our office. Whether you want to alleviate pain or live life at your full capacity, Dr. McAvoy and Dr. Kurtz are ready to help. Same-day and Saturday appointments are available, and we are in-network with most insurance companies. Contact us today to get started! We've completed advanced training in areas such as soft tissue injuries and rehabilitation, including the Graston Technique. With this full-body approach, you won't just get better - you'll be excited to refer your family and friends to us!